Scotch Spearmint (mentha x gracilis) - Also called "American red mint", this is the spearmint variety used to flavor candies, gums, etc. by the commercial mint industry. 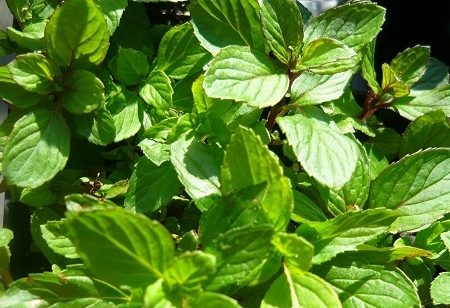 This hard to find variety has a very strong and especially sweet spearmint aroma and flavor. Excellent culinary and tea variety. One of our customers favorites. Easy to grow perennial zones 5-9. May be shipped dormant in winter. Live starter plant in 3 inch container. I have just made a purchase of over 25 different herbs from this nursery including this Scotch spearmint. I don't know if it is just the power of suggestion but I have been to Scotland several times and a nice long smell of this plant did to me, smell a lot like the scent you catch when a breeze blows across the Scottish highlands. Call me crazy! I buy herbs from many Nursery's Colonial Creek is the best ever. Every herb arrived in perfect shape well established and very healthy and a great size ready to transplant and take off growing. Love these people, plants obviously were grown and cared for with a lot of TLC. I normally would not take the time to comment on every plant purchased but this Nursery deserves it. And the price is a true bargain for the quality. I Highly recommend this grower.